Grand Central Market | Press Coverage | Los Angeles Times | By Amy Scattergood &quot;What&#039;s your spirit noodle?&quot; is the question posed on cards and on T-shirts worn by the pasta makers and line cooks at Knead &amp;amp; Co.
"What's your spirit noodle?" is the question posed on cards and on T-shirts worn by the pasta makers and line cooks at Knead & Co., the new pasta bar and market opening this week at Grand Central Market in downtown Los Angeles. One T-shirt stipulated "orriechiette." If you've spent a lot of time at Union, the Pasadena restaurant also from chef Bruce Kalman and Marie Petulla, it might well be spaghetti. But it's exactly the right question to be asking these days in Los Angeles, which is going through a pasta renaissance at the moment, and at Knead, which opens for full service on Thursday. The market opens the day before, selling pasta and flours, tomatoes and olive oil, as if to give us all a running start. Knead & Co. occupies about 720 square feet of real estate along the southwestern wall of Grand Central Market, the century-old food court between Hill and Broadway. It's a pretty big space for a food court stall but a very small space for a full restaurant. By contrast, Union, itself a very small restaurant, is about 1,230 square feet, although Petulla points out that only about a third of that is its kitchen. Knead is pretty much all kitchen: a long corridor of space filled like a ship's galley with four 6-burner stoves, a double-wide pasta cooker, a deep fryer, a dish station, a production line that includes a pass on which sits a firehouse red Berkel slicer, and a pasta room filled with tables and an impressively large EmilioMiti pasta extruder. Above all of this is a salamander, rows of shiny new pots, a storage area and a retractable ladder by which to reach it. When you wedge an entire restaurant into what was previously a few market stalls, the result is kind of like crossing a storage closet with a submarine. As for what kind of food he'll be cooking, Kalman described the menu as "a combination of Jersey, Italy and California." "I've always wanted to do a pasta bar," said Kalman the other day, as he stirred a vast pot of tomato sauce on one of those 6-burner stoves. The folks who run Grand Central asked him to come to the market, he says when asked why he chose the location. "And at the same time, it was like fate. We needed a commissary for Union." Thus the new restaurant, where Kalman and his team now make all the pastas not only for Knead but for Union as well. And the pasta is all made using locally milled flour from Grist & Toll in Pasadena. That enormous Italian extruder makes pasta in 20 shapes, as well as ravioli. What pasta isn't made with the machine is made by hand, on the wooden tables jammed into the window-facing side of the pasta room. 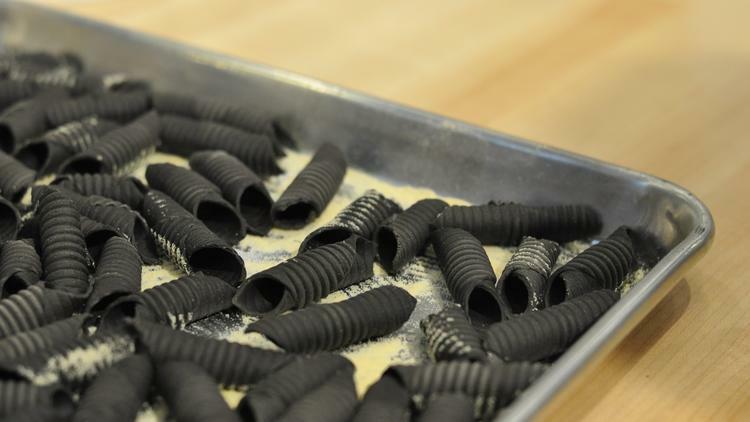 Look for charcoal wheat orzo, squid ink garganelli and tagliolini, spelt cavatelli, just to name a few. The pasta will go onto the Knead menu, which features not only dishes such as Sunday gravy spaghetti and meatballs, bucatini al amatriciana, smoked duck agnolotti and ricotta-kale ravioli, but hand pies, grain bowls, salads, sandwiches, breakfast dishes and desserts (tiramisu! cannoli!). If you don't have time to sit down to eat at the restaurant's 16-seat counter, you can buy the pasta — fresh, frozen or dried — and take it home. The market section of Knead also carries Grist & Toll flours and grains, cans of tomatoes, olive oil and Santa Monica honey. Porchetta lovers should know that one of the sandwiches Kalman has on the menu is kind of a hybrid of the revered Italian roast pork dish and a French dip sandwich. The porchetta is thinly sliced on that Berkel, then loaded onto a baguette (also made from Grist & Toll flour) with pickled mustard seeds, roasted rapini, chicharrón — and served with a little cup of pork jus. 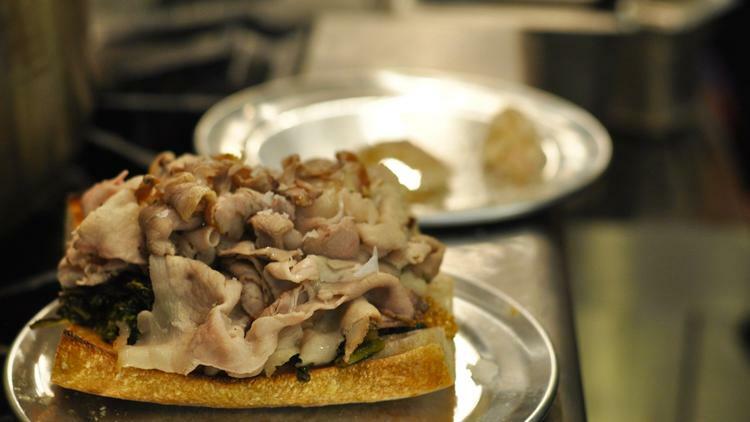 This shouldn't surprise anyone who frequents Union, where Kalman's porchetta is the stuff of local legend. "The OG meat sandwich, that's what we should call it," said Kalman as he showed his staff how he wanted the porchetta sandwich plated -- in the cardboard to-go containers that everything from Knead will be served in. Which is to say that Kalman isn't focusing only on rolling out sheets of pasta. He's bringing in whole pigs, curing his own ham and making vats of ricotta. "We're doing what we do. We make everything." "I don't cook for my ego anymore," said the chef, handing half of a porchetta dip sandwich to one of his cooks. "I just like to make people happy." 317 S. Broadway, Los Angeles.